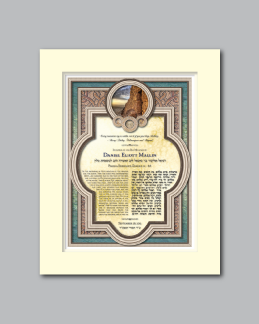 Personalized Bar or Bat Mitzvah Art :: "Masada"
This B'nai Mitzvah art is called "Masada", after the ancient stronghold in the land of Israel. It was in that place that Jewish rebels revolted against Roman tyranny after the destruction of the Temple. The outermost portion of the design depicts a serene background of water, referencing the nearby Dead Sea. The high salt content in those waters makes it almost impossible to sink. An apt symbol for the dedication displayed by the Jewish people for centuries. 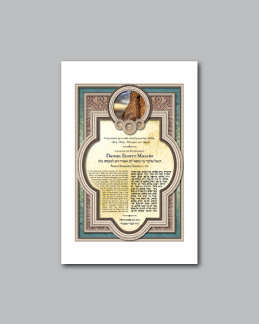 Overlaying the watery background and separated by a silver border is a pattern of mosaic tile reminiscent of the floors and interior of Masada. At the top of the design, within the circular silver window, is a majestic view of Masada and the rising sun, symbolic of the potential of each new day. Each, a gift from Hashem. 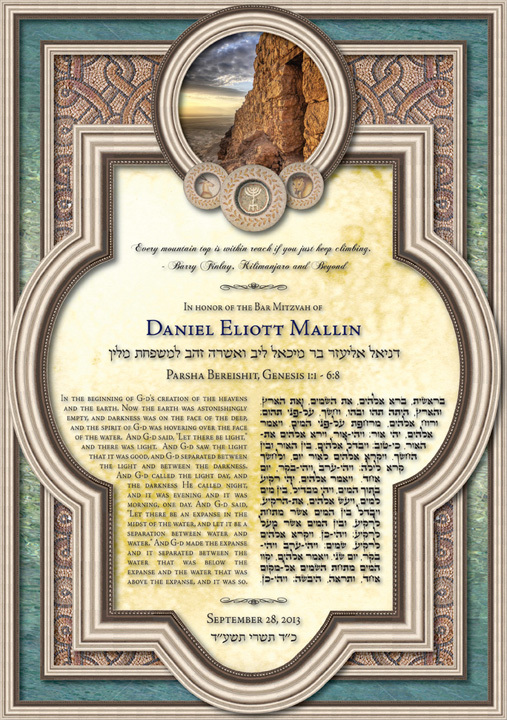 Within the text area of the design, above the name of the B'nai Mitzvah, is the following inspirational quote by Barry Finlay, author of Kilimanjaro and Beyond, "Every mountain top is within reach if you just keep climbing". 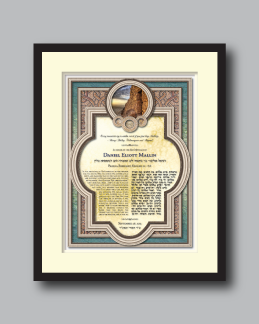 These words, along with the imagery of of Masada, are meant to inspire the Bar or Bat Mitzvah boy or girl to cherish the gift of life, freedom won by generations of the past, and to strive to fulfill the vast potential that lies within.